But this guy was protesting something else. War betrays all Women's Rights"
Not sure how he connects this all up with women's rights at the end, but might as well try, right? For women to have the rights that they should, they need to fight the good fight too. That type of war does not betray them, but bolsters their cause. Everyone who has been abused, enslaved, and discriminated against needs to free themselves of the shackles of oppression. 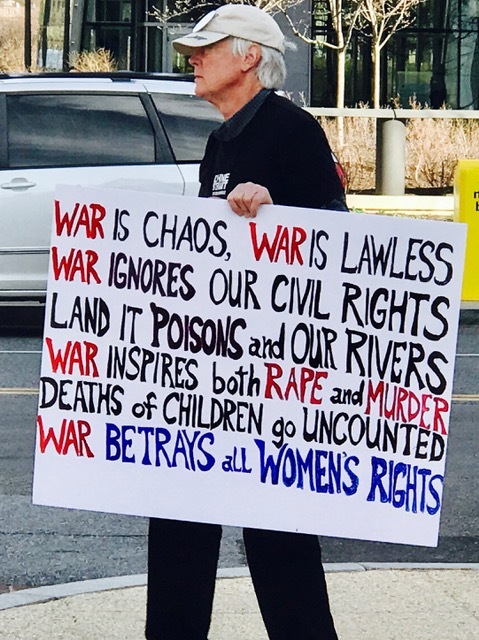 What we do know is that "war is hell!" And certainly war is an option of last resort. At the same time, war can restore the peace and right the wrongs of despots and tyranny and violence and persecution. War is something to be feared and avoided, until it can't. At which time, hell on earth is released, so hopefully peace can ultimately prevail once again. In war, everyone loses, but with the hope that at the end, good wins! For woman, today is also the continuance of that war and fight for equality, respect, and proper treatment in every way they completely deserve.